Lisbon and the Sunny Coast: Santo António - classic or trendy? Santo António - classic or trendy? Old building wall and urban handicraft window shop (both shots taken at Oeiras downtown). The first picture is magnificent! "Santo Antonio is a doctor of the Church. Born in Lisbon, Portugal in 1195.Padroeiro of boyfriends. Its popularity stems from the fact that it is regarded by tradition as matchmaker saint." 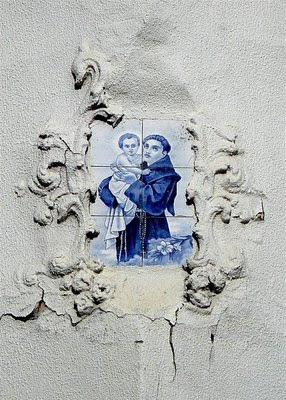 "Santo Antonio é doutor da Igreja. Nasceu na cidade de Lisboa, Portugal, em 1195.Padroeiro dos namorados. 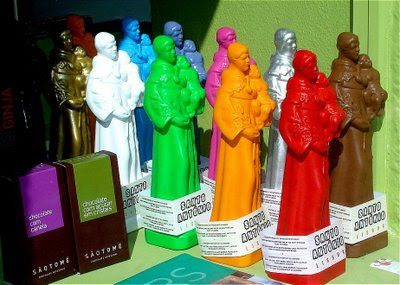 Sua popularidade advém do fato de ele ser considerado pela tradição como santo casamenteiro"
Oh man, look at those colors! Do you think St. Antonio would get a kick out of it? The classic is my favorite! The Antonio tiles are wonderful! Yes, I agree St. Antonio would get a kick out of it. What is he the patron saint of? You have a great eye for finding such good pictures! I especially like the first one. The blue is beautiful! I prefer classic! Beautiful photos! I love the traditional tile. The figures look like they are from a cartoon of space creatures. Your comment on my site today prompted me to tell my story about being attacked at night in the jungle by a wild animal, which I hope you will enjoy. The "soap bubble" thingys, not so much. Good job, JM, as good photos generally stir things up a bit! I'm in agreement with the others. The top photo is so understatedly elegant. The second subject is so over the top garish. In my book , there's nothing like the crumbling classic. those bright colors sure make for a vibrant image! Great wall art photo, JM... thanks for visiting. Oh well spotted, I love that second picture, so funny! There's something about tacky religious kitsch, isn't there?! Oh the top one is just lovely and the bottom photo made me laugh out loud! I had a flashback to the old Saturday Night Live episodes with Father Sarducci hawking the "Find the Pope in the Pizza" keychains! Hilarious. Yes, Jm we must know what's inside the plastic bottles!!! Don't know what it says about me but I like the colourful ones! Well, I'm just speechless, and for two different reasons. Santa Maria! What are they thinking? The two pictures together are a great mix. What I like best is probably the chocolate in the second picture. By the way, I probably have to cut down on commenting a bit due to lack of time. Hope you'll understand, because I still really appreciate your blog JM! If those colored 'statues' are chocolate, I'll take them! I love that one on the building. Happy Easter to you... if you celebrated it. Haha this is fantastic! I love this theme of classic vs trendy. Great idea. Wonderful juxtaposition of images. The top one so delicate and the bottom so bold. I wonder if the top one was considered kitsch in its time? The first one for its beauty .